Cancellations must be received in writing prior to Early Bird Deadline. Refunds will be processed within 30 days after the meeting. Refunds will not be granted after Early Bird Deadline. 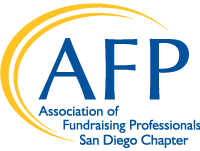 Those who RSVP, state they will pay onsite and then no show, will be billed at the rate when the individual first contacted the AFP San Diego office.